What is it about PMP project management that makes it such an in-demand certification? Being PMP certified can unlock incredible opportunities to advance your career and optimize the value of your organization’s essential projects. Here’s everything you need to know! What is Project Management Professional (PMP) and why do you Need it? Competence, skills and experience are vital for managing organizations from day to day, but managing individual projects can be an entirely different challenge. Having to oversee employees and resources within strict constraints in order to achieve very specific goals can often require a different management style altogether; one that is polished by solid experience and proven best practices. Continually following a proven framework or methodology has a lot to offer, even if self-taught managers might not want to admit it. It can help organizations to save time, money and effort which is often wasted by vagueness and indecision. At the same time, a manager must be aware of how to adapt their methods in order to suit unique project environments, as well as unforeseen challenges. 'Project Management Professional (PMP)' is a highly respected management certification offered by the Project Management Institute (PMI). Even with so much competition from other standards, PMP stands out as one of the most highly-respected qualifications that a manager can achieve, but why? How do you Qualify for the PMP Exam? In short, even qualifying for the PMP exam is an achievement in itself! The process also requires a great deal of organization, especially in relation to accruing and documenting the hours that a candidate must spend managing projects. Unfortunately, things do not get easier after this point. The PMP examination features 200 multiple-choice questions, to be completed in four hours. It covers the Project Management Body of Knowledge (PMBOK Guide), a comprehensive source on project management which is updated every four years to ensure that its best practices reflect modern ITSM. All of this makes having a PMP certification an excellent validation of a project manger’s experience, knowledge and, most importantly of all, dedication. A PMP qualified manager will be comfortable utilizing processes, inputs, tool and techniques to bring about successful project results, regardless of an organization’s industry, sector, size or location. They will also have demonstratable experience with both hard and soft project management skills - either that, or their qualification will be fake! Some simply use PMP training to augment what they already know in preparation for the exam. However, even experienced managers who begin studying the PMBOK guide will usually be able to gain new insight from it. How can a PMP Certification help my Business? Taking a PMP course and achieving the certification can offer numerous advantages for managers. It will validate a candidate as having thousands of hours worth of project management experience, as well as a solid education in modern best-practices. There is no shortcut to reaching this point, as the PMI will heavily audit a candidate in order to make sure that they are eligible for the exam. As a result, PMP-qualified managers are in extremely high demand, allowing them to unlock not only upper-tier management positions and networking opportunities but also impressive salaries. According to the 2018 PMI Earning Power Report, respondents who held PMP certifications were reporting 23% higher salary medians than their non-certified colleagues. This was based on 33,000 managers from across 37 countries, all of which offered opportunities for certified candidates. Many companies will even expect PMP certificates as standard for anyone applying for higher roles. So, managers have a number of reasons to pursue PMP courses, but why should companies invest in them? Put simply, ensuring that managers have a good working knowledge of the techniques, inputs and tools of the PMBOK knowledge areas and processes can have hugely beneficial effects when it comes to company projects. Not only will it increase the likelihood of project success, but it can also drastically reduce wastage, ensure higher quality results and even encourage a more productive and generally positive workplace environment. Why Gain a PMP Certification with Good e-Learning? When looking for a PMP project management course, it may be tempting to search for options which are both quick and cheap. There are even providers which claim to be able to offer certifications which enable students to get around the PMI auditing process. Unfortunately, this is simply not true. In order to achieve a PMP certification, you must meet all of the PMI’s eligibility requirements. This includes getting through at least 35 contact hours of high-quality project management training. 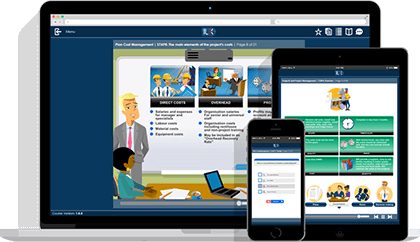 Good e-Learning offers a variety of top-tier and fully-accredited online project management courses. Our award-winning portfolio covers the most popular standards on the planet, and we work to ensure that our students can enjoy the best quality training possible. Our Project Management Professional (PMP)® course comes from the ILX Group. Based on the PMBOK Guide, it comes complete with numerous practical examples to help users understand how to implement project management best-practices in real-world organizations. Students can also enjoy a variety of engaging learning tools, including animation, audio-narratives and practice exams to solidify their new knowledge. We even offer 24/7 tutor support from our own team of in-house experts. Want to learn more? View our full portfolio of Project Management courses, or find out more about corporate PMP training offers!